Come to think of it, the lyrics of "I Hope They Call Me on a Mission" don't make much sense. There's a pretty clear path to missionary service laid out in front of any prospective missionary regardless of whether or not he or she experiences a growth spurt. Still, it is quite catchy. 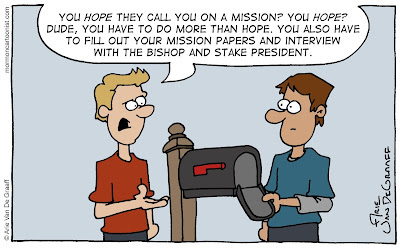 Perhaps it could be worded this way: I hope to make the calls that get me a mission call...before I grow a foot or two. Heavenly Father always expects us to DO, rather than wait around... ASK and it shall be given unto you, SEEK and ye shall find, KNOCK and the door will be opened unto you - get the picture?